New Research Help Page and Chat Service! The Arthur A. Wishart Library has launched a new help page and chat service to assist students with their research. The chat service is available from the Research Help page by selecting "Chat with us" in the column on your right. 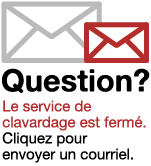 When the service is closed, you will see an "Email us" link in the same location that is directed to library staff. We're here to help!